Preheat the oven to 400 degrees F and line a small rimmed baking sheet with all natural parchment paper. Spread chickpeas out on paper towel and pat dry. Transfer to a small bowl and toss with coconut oil, salt, pepper, and garlic powder. Spread out in a single layer on the prepared baking sheet and roast, stirring occasionally, until chickpeas are browned and starting to crisp, about 30 minutes. Remove from oven and set aside. They will crisp up further as they cool. Remove chicken breast from the fridge and let rest for 30 minutes. While the chickpeas are baking, add tahini and next 7 ingredients (through tamari) to a food processor. Begin to process and add water slowly (up to 1 cup) until smooth and creamy. Heat 4 cups water over medium heat in a small pot. Once boiling, add green peas and blanch for 30 seconds. Drain and set aside. Prepare your blackening rub by tossing the next 8 ingredients (sea salt through cumin) together in a small bowl. Prepare your romaine hearts by tearing away any loose whole leaves. Set these aside. Slice the top quarter off of each romaine head and roughly chop these with any loose leaves you removed. Set aside. Coat your chicken breast with blackening seasoning on both sides. Once the grill is hot, add chicken and grill for 4 minutes on each side. Transfer to a plate and cover. Lightly coat romaine heart with coconut oil, and place on the grill. Cook until charred, and grill marks appear; rotate to cook on all sides. Uncover the chicken and cut into 4-6 strips. Make sure the chicken is fully cooked (no pink in the center). To plate, start with the romaine lettuce that you cut up. Plate half on each of two serving plates. 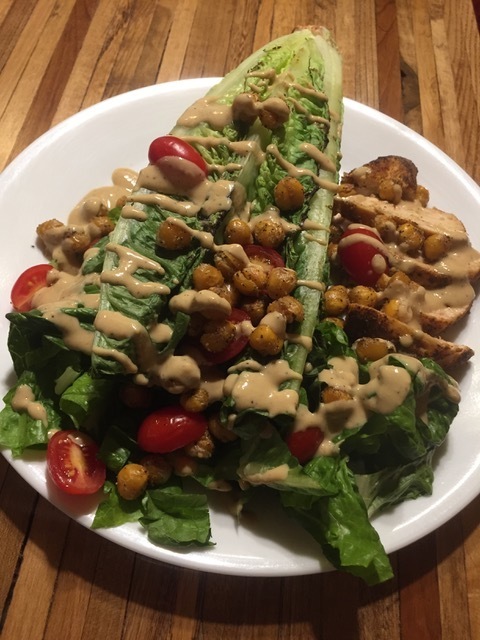 Top with a grilled romaine head, chickpea croutons, blackened chicken strips, and tahini Caesar dressing. Store any leftover dressing in an airtight container in fridge. Recipe Note: If you do not have a grill, sear your seasoned chicken breast in a skillet over medium-high heat, 30 seconds on each side. Transfer to a baking dish and bake in a 350 degree F oven for 10 minutes, or until juices run clear and chicken is cooked through (no pink in the center). To cook the lettuce hearts, use a grill pan over the stove, or sear in a pan.